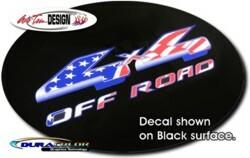 Detail your "American Made" Ford F150 or Super Duty Pickup with this themed Patriotic 4x4 decal that can replace the existing easily-removable factory decal. Packaged in a set of two (2) and is uniquely designed in Red, White and Blue with a fine Gold outline. A Blue to White faded outline and drop shadow finishes off the custom design as shown in the picture. Make your truck REALLY stand Out! Easy to follow application and care instructions are included.